Contents. Structure, physical and chemical properties of pectins. Complex pectins: Structure elucidation using enzymes (H.A. Schols, A.G.J. Voragen). Physicochemical properties of pectins in solution and gel states (M. Rinaudo). Pectin biosynthesis and biological effects of (degraded) pectin. Plant cell wall architecture: the role of pectins (M.C. McCann, K. Roberts). Cell wall pectins: From immunochemical characterization to biological activity (P. van Cutsem, J. Messiaen). Contribution of pectins on health care (H. Yamada). Identification, mode of action and 3–D structure of pectinases. New enzymes active towards pectic structures. (G. Beldman et al.). Erwinia ectate lyase differences revealed by action pattern analyses (S. Bartling, et al.). Molecular genetics and regulation of pectinase biosynthesis in saprophytic and phytopathogenic microbial systems. Expression of polygalacturonase and pectinesterase in normal and transgenic tomatoes (G. Tucker, J. Zhang). Applications. A) Developments in pectin manufacturing and applications Effects of extrusion–cooking on pectin–rich materials (J.–F. Thibault et al.). B) Application of pectinases in beverage, food, feed and novel technologies. Application of pectinases in beverages (C. Grassin, P. Fauquembergue). Production, characterization and application of rhamnogalacturonase (H. Hennink, H. Stam, M.G. van Oort). Structure, physical and chemical properties of pectins. Modelling a pentasaccharide fragment of rhamnogalacturonan I. (M. Broadhurst et al.). Quantitative Raman spectroscopy. Prediction of the degree of esterification in pectins (S.B. Engelsen, L. Nørgaard). Pectins from different tissue zones of apple: characterisation and enzymatic hydrolysis (P. Massiot, A. Baron, J.F. Drilleau). Structural studies of a pectic polysaccharide from Plantago major L. (A.B. Samuelsen et al.). Pectin biosynthesis and biological effects of (degraded) pectin. Metabolism of pectin in the gastrointestinal tract (G. Dongowski, H. Anger). Pectins and pectinases in stem rust–infected wheat (M. Mierau et al.). Identification, mode of action and 3–D structure of pectinases. Isolation, characterization and immuno localization of orange fruit acetyl esterase (T.M.I.E. Christensen, J.E. Nielsen, J.D. Mikkelsen). Influence of glucose and polygalacturonic acid on the synthesis and activity of the polygalacturonase from the yeast strain SCPP (A. Gainvors, A. Belarbi). A polygalacturonase inhibitor of Dieffenbachia maculata (A. Chitre, N.V. Shastri). Molecular genetics and regulation of pectinase biosynthesis in saphrophytic and phytopathogenic microbial systems. Primary structure and characterization of a exo–polygalacturonase from Aspergillus tubingensis (H.C.M. Kester et al.). Production of pectinases from Rhizopus sp. in solid substrates (L. Chitradon et al.). Polygalacturonase and pectinmethylesterase activities during growth of Helianthus annuus 1805 cell suspension (M. Ilieva et al. Applications. A) Developments in pectin manufacturing and applications. Influence of microwave pretreatment of fresh orange peels on pectin extraction (M. Kratchanova et al.). B) Application of pectinases in beverage, food, feed and novel technologies. Enzymatic maceration of apple parenchyma: modelling of the degradation (A. Baron et al.). Enzymatic treatment in the extraction of cold–pressed lemon peel oils (L. Coll et al.). Pectinases in wood debarking (M. Rättö, L. Viikari). Pectins are one of the classes of complex structural plant cell wall polysaccharides. They are localized in the middle lamella and primary cell wall of higher plants. Pectins have a long-standing use as gelling agents whereas their enzymatic degradation or modification plays an important role in the processing of agricultural crops and the manufacturing of foods and beverages. Progress in pectin and pectinase research has been most prominent in two areas over the past 5 years. The first one concerns the analysis and elucidation of the complex chemical structure of pectin and identification of novel enzymes involved in the degradation of these structures. The second area concerns the mode of action and the 3-dimensional structure of various pectin degrading enzymes as well as the cloning of a large number of genes encoding enzymes involved in pectin degradation and modification. 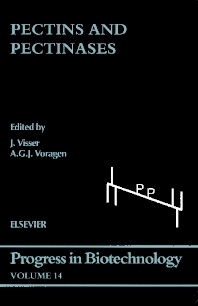 This book covers the following topics. First the structural, physical and chemical properties of pectin are treated followed by information about its biosynthesis and about the biological effects of pectin and its degradation products in biological systems such as plant-pathogen interactions and human nutrition. Identification of novel enzymes, the mode of action of different pectinases and the 3-D structure of bacterial pectate lyases forms the second block. This is followed by the genetics and regulation of pectinase biosynthesis in saprophytic and phytopathogenic microbial systems as well as in plant systems. Finally, developments in pectin manufacturing and application of pectinases in traditional (food, beverage) and novel technologies are treated. This book is meant for those actively involved in fundamental and applied aspects of pectin and pectinase research but it is also of value for those interested in plant cell wall biosynthesis and architecture, phytopathology, food technology and human nutrition. This book not only reflects the present status of research in the field but it will turn out to be a very useful reference work as well.